In September 1899, Maillart resigned from Zürich's Stüdtisches Tiefbauamt (municipal civil engineering department) to pursue his interest in using concrete to express structure directly, unadorned by any form of cladding. Staying in Zürich, he immediately began working for design and construction engineer Frôté & Westermann as lead designer. The ethos of the company was much to his liking. Frôté & Westermann, founded three years earlier in 1896, had tendered unsuccessfully for the Stauffacher Bridge project that Maillart had eventually engineered. Maillart and Frôté & Westermann shared the view that it should have been a visible reinforced concrete arch — without the masonry cladding Maillart had to contend with. Furthermore, Frôté & Westermann was a licencee for the Hennebique method of reinforced concrete construction. By 1898, Switzerland had more concessions (thirteen) for the use of François Hennebique's (1842-1921) patented béton armé system than any country outside France. Maillart learned Hennebique's techniques and, through them, current French design principles. These formed a counterpoint to the German approach embodied in (Karl) Wilhelm Ritter's (1847-1906) teaching during Maillart's undergraduate years. However, Hennebique — like most contemporary structural engineers — used reinforced concrete as a substitute for timber, stone or steel. Maillart was determined not to go down this route. For the design of bridges, he would take Hennebique's idea that beams, columns and slabs could be cast as monolithic units and use it as the starting point for the development of thin curved hollow bodies of reinforced concrete. The elegant slenderness that resulted had not been seen in bridges before, and wasn't achieveable using more-traditional building methods. To begin with, Maillart helped with the calculations for the Solis Viaduct, under construction by the Rhätische Bahn (Rhaetian Railway) in the Albula district of eastern Switzerland. The bridge, a 42m span masonry arch designed using elastic theory, consists of three concentric layers of stone for the arch. Costs were minimised by using scaffolded centring for the construction of just the first ring of stone. That ring then acted as centring for the next layer, and so on. Maillart would soon adapt this approach for use in concrete casting. Maillart was now 28 years old, and he was about to get the chance to construct his first three-hinge arch hollow-box reinforced concrete bridge. On 16th August 1900, acting for Frôté & Westermann, he submitted a design report to the town council of Zuoz, east of Albula in Graubünden canton. It was for a 30m span road bridge (Zuoz Bridge) across the Inn River, just outside the town, in concrete rather than the steel bridge proposed by district architect Ottavio Ganzoni (1873-1963). In September, the contract was awarded to Frôté & Westermann. The design was to be scrutinised by Ritter. Maillart was in Paris at the time, attending the Exposition Universelle and meeting Aimé Joseph Bonna (1855-1930). Bonna was another French pioneer of reinforced concrete, a competitor of Hennebique's. Maillart was negotiating for Frôté & Westermann to use Bonna's techniques in Switzerland. In this period, Maillart was also working on other projects, including the city of Zürich's first bridge in reinforced concrete (a beam bridge, now demolished), which carried a cog rail line over Hadlaubstrasse. He was also involved in the construction of the concrete frame for the Schatzalp Sanatorium in the mountains of Davos, Graubünden canton. Frôté & Westermann used the Hennebique system for this, and it opened on 21st December 1900 (now a hotel). Meanwhile, Maillart's 1899 Stauffacher Bridge had been making an impact in Zürich. On 30th January 1901, he was invited to become secretary to the city's branch of the Swiss Society of Engineers & Architects (schweizerischer ingenieur- und architektenverein or SIA). The same day, a lecture was held on Hennebique's methods, which Maillart attended. His report on the lecture was his first piece of professional writing and it appeared in the journal Schweizerische Bauzeitung on 25th May 1901. Late in July 1901, Maillart travelled to Zuoz — a day's journey from Zürich by rail and horse-drawn bus — to supervise the concrete casting for the Zuoz Bridge. Acting as designer/contractor made it possible for Maillart to develop an efficient, and therefore cost-effective, method of construction. Formwork for the arch slab was first installed, the arch cast and left to harden, the formwork removed and then the arch itself used to support the casting of the longitudinal walls and deck. Maillart was to use this technique many times in the coming years. While in Zuoz, Maillart stayed at the Hotel Concordia on San Bastiaun. The evening meal was served on a long communal table and it was here that Maillart encountered a young Italian woman, Maria Ronconi (1872-1916). But not until the eve of his departure, on 1st August 1901, did he dare speak to her. That same evening, he proposed marriage. Maria, an orphan from Bologna, was short in stature at 1.6m (5ft 4in), with dark hair. Her parents, who had passed away, were Benedetto Ronconi and Adelaide del Santo (d.1899). She had a brother Arnoldo, and she had attended convent schools near Florence in Italy and at Namur in Belgium, where she had learned to speak French, which she spoke with Maillart. She then become a governess in Turin, and joined the Wild family — Mr Wild was from Zürich and Mrs Wild, Italy. Maillart and Maria's engagement was announced in late August 1901, after they had visited Maillart's family in Berne. Maria was to find a life-long confidante and friend in Maillart's mother Bertha. The couple found an apartment on Rigiplatz in Oberstrass, Zürich. Maria moved in during October, while Maillart lived in separate bachelor accommodation. On 11th November 1901, they were married at the church of the Holy Ghost in Berne followed by a family dinner at a local hotel. They immediately moved into their apartment, deferring their honeymoon. By this time, Maillart was beginning to feel that he had completed his apprenticeship working for established engineering companies. He was ready for the challenge of running his own business. With Maria's support, he broached the idea with his colleagues Max von Müller (c1876-1927) and Adolph Zarn, and shared his thoughts with Frôté & Westermann. 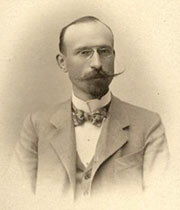 On 1st January 1902, presumably by mutual consent, Maillart left the company. He and Maria now took their honeymoon in Italy, spending a fortnight visiting her friends and relatives in Turin, Genoa, Florence and Bologna. Back in Zürich, Maillart threw himself into a frenzy of publicity for the launch of his new business, Maillart & Cie. On 1st February 1902, a few days before his 30th birthday, the company was officially founded, with Maillart as its principal. Müller, who was wealthy, provided the finance and Zarn became the accountant. Maillart was now a married man, an entrepreneur and a reinforced concrete pioneer. 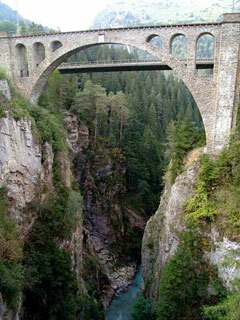 The Solis Viaduct (1902, Hans Studer) on the World Heritage-listed Rhätische Bahn (Rhaetian Railway) in the Albula district of eastern Switzerland. Maillart helped with the calculations when he started working for Frôté & Westermann. 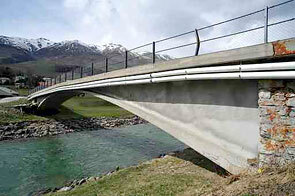 Maillart's first three-hinge arch hollow-box reinforced concrete bridge. 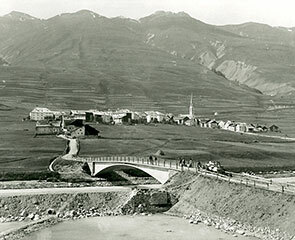 The Zuoz Bridge (1901) crosses the realigned River Inn just outside the village of Zuoz, east of St Moritz. At the time, Maillart was chief designer for Frôté & Westermann in Zürich. The Zuoz Bridge in April 2011. The arch is hinged at each abutment and the centre point, a format it has in common with many Swiss non-concrete bridges of the time. In addition, each half of the bridge is a hollow body, consisting of the arch, side walls and the deck, which 'closes' the box. Maillart's understanding of the potential of reinforced concrete as a material enabled him to develop bridges that look startlingly modern, even today.